It was shortly after dawn on a very chilly February morning and I was the only person at Fort Phantom Hill. I had been there for more than an hour and not a single car had passed by on the road. If it wasn’t for power lines in the distance, I could have believed this was 1851. 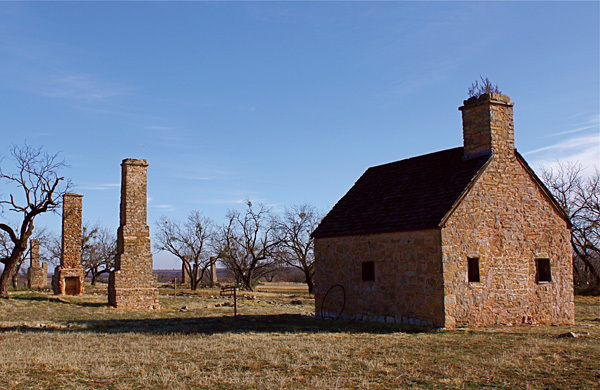 Back in the 1850s the U.S. Army had a line of forts in Texas that were commissioned to protect settlers moving into the Comancheria during the western expansion. But as the settlers moved further west, the locations of the forts proved problematic. They were too far away to protect the new settlers. In response, the army built a second line of forts further west, one of which was officially titled the “Post on the Clear Fork of the Brazos.” Five companies, fully 6% of the entire US Infantry, were stationed there. Through a series of bad decisions, the fort got placed in a very poor location called Phantom Hill, so named because, from a distance, a hill rises sharply from the plain, but it disappears as you approach it. The spot was too far from water and timber and it made life difficult for the soldiers there. As a result, it was abandoned after only three years (1851-1854). It would later be reincarnated three times, once as a way station for a mail stage company and twice as a fort, during the Civil War and the Indian wars. In the 1880s a town of more than 500 grew up around the ruins of the fort, but it disappeared when it lost an election for the county seat to the nearby town of Anson. The town, and the fort, would be remembered in history as Fort Phantom Hill. I was walking the pathway between the rows of chimneys that still stand, long after the cabins they warmed had burned to the ground, and the old stable, a long stone ruin with no roof. It was just me and the sound of the wind. Just as I passed the two old wagons, something flashed in front of me. It was a rattlesnake—in February! I jumped back and felt the instantaneous flood of the adrenaline rush. There was the tingling, burning skin, the gasping for breath and the general sense of total savagery that comes with any huge influx of adrenaline into your bloodstream. And it made absolutely no sense. Long ago I made my peace with snakes. I’m not sure how or why it happened, but somewhere back in the ‘80s I decided that they, like a dog, a duck, or a deer, were my brothers and we had noting to fear from each other. I would do nothing to hurt them and they in turn would do nothing to hurt me. We both have kept our parts of the bargain for nearly 30 years now. I have not hurt a snake in any way and they have returned the favor. There have been three occasions where poisonous snakes were within inches of my feet and one case, as I was swimming in Lake Mija, where a water moccasin came within a foot of my face. They didn’t strike. When it comes to snakes, I have no concern whatsoever. As a result, in a matter of a second or two, reason prevailed and I stopped being afraid. But it took much longer for the adrenaline-induced tingling and burning to subside. And it took a whole lot longer for me to figure out what just happened. Thinking about it took me back to the days of Hurricane Ike. I thought about that week many times in the five years since. It was very out-of-character for me, and I am sure, for most of the neighborhood women as well. What was happening? I have come to the conclusion that all the violence of the storm, the damage to our homes and the primitive living conditions brought out something in us that made us much more aware of the sexual tension. Fear, first of the storm, and then of how we were going to survive the losses, reduced us to some primal level. It was something I have never experienced in my life before or since. We went into survival mode. When that happens to us, our senses grow sharper in order to detect threats. That heightens our sensory perception and makes us more aware of everything around us, including sexual tension. I’ve often heard people say they were “scared to death.” What happened to us was different. In essence, we were “scared to life.” For a brief time, we became totally aware of everything around us—and completely subject to our instincts. We often think of instincts as something that only the other animals have—and that we, as humans, have risen beyond that. But we all have natural, unreasoned reactions to certain things. Sometimes when threatened, we duck and cover, trying to be invisible in hopes that what is threatening us will go elsewhere. In other circumstances, when threatened, we attack, even if it is not the wisest move. Sometimes we run. If things are going badly, we choose to just leave. No point in trying to fix it. And then there is my own personal demon; when stressed, I eat. These are all instincts—things we do without thinking. They are automatic responses. This raises all kinds of interesting questions. Where do these instincts come from? Are we born with them? Do we develop them as children? But I think a more interesting question is, haven’t we by now outgrown the need for them? When the snake darted across my path, like those days around Ike, instinct kicked in and rationality fled. I’m sure the instincts we have were, at some point in human history, important to our survival. Rattlesnakes can be dangerous after all. But if I look at the instincts that show up in my life today, almost all of them are destructive. The rest are at best, unhelpful. When we find we have acted instinctually, we can rationally look at our behavior later, when we have had time to “come down” from the adrenaline rush, the fear, the anger, or the hurt, and realize that the event forced us to act in a way that was contrary to our best interests. But by then, the damage is done. And yet, we had little choice. Instinct remains far longer than the need for instinct. I guess that is just the nature of being the human animal. On the bright side, it did make the post-Ike days more bearable—maybe even a little fun. I really like this line, Michael: “Instinct remains far longer than the need for instinct.” Your articles make us think, and I thank you for that.